12 They went out and preached that people should repent. 13 They drove out many demons and anointed many sick people with oil and healed them. When we make a cake it needs the right ingredients to taste great. We follow recipes for successful and tasty cakes. To discover what true repentance looks, tastes and feels like, there are Biblical recipes to follow too. These final two verses are from Mark’s account of Jesus sending out The TWELVE (Mark 6:7-13). The two verses summarize the specifics of the 12 Apostles’ mission. It mirrors what they had seen Jesus do. With His authority and enablement, they cast out many demons. They anointed with oil many who were sick and healed them (cf. Jas 5:14-16). They went out and preached repentance, the same message preached by both John the Baptist (Mark 1:4) and Jesus ( Mark 1:15). They were to go as servants. They were not to compromise their message even if it brought rejection and persecution. They had to have the courage to tell the truth about Jesus and the gospel. If “repentance” was the first word out of the mouth of John the Baptist, The Lord Jesus Christ, and the 12 Apostles (Acts 2:38), then it must be an important component of the true gospel message today and it marks the starting point of the true Christian life. Thomas Watson, and Old English Puritan (ca. 1620-1686), wrote a helpful treatise on repentance. He stated, “Repentance is a grace of God’s Spirit whereby a sinner is inwardly humbled and visibly reformed” [Watson, Doctrine, 18]…. Watson identified six ingredients necessary for true repentance. The first is sight of sin, whereby a person comes to themselves (Luke 15:17) and clearly views their lifestyle as sinful. If a disciple fails to see their sin, they are rarely motivated to repent…. (That’s why we take time to show people how they’ve sinned against God by using His Ten Commandments: How we’ve all offended a Holy and Righteous God). 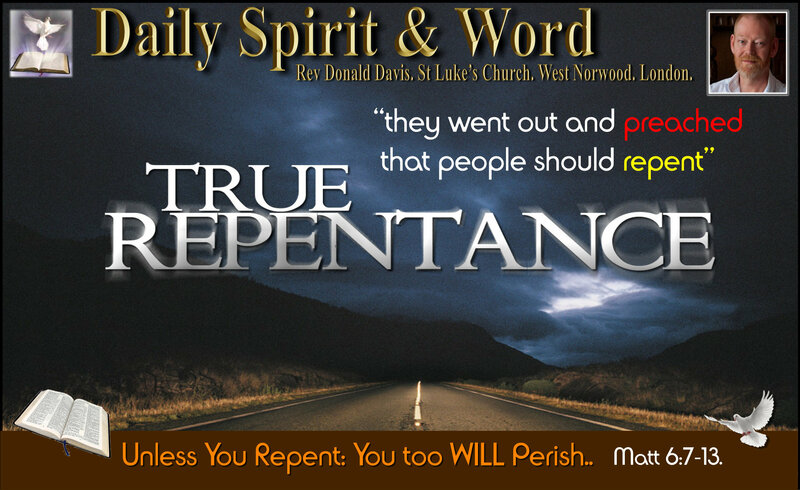 The second ingredient for true repentance is sorrow for sin (Ps 38:18). We need to feel the nails of the cross in our soul as we sin. Repentance includes a godly grief, a holy agony (2 Cor 7:10) i.e. “It’s because of my sin those nails pierced the Saviour’s hands”. The fruits of repentance will be expressed in genuine, anguishing sorrow over the offense itself and not just its consequences. This sorrow for sin is more than just a “worldly grief”; it will be seen in the ongoing actions it produces (the fruit of repentance is a changed life). Confession of sin gives glory to God (Josh 7:19). Confession of sin is a means to humble the soul (2 Chr 26:19). Confession of sin gives release to a troubled heart (Ps 51:11-12). Confession of sin endears Christ to the soul that needs atoning (Rom 7:25). Confession of sin makes way for forgiveness (2 Sam 12:13; 1 John 1:9). Confession of sin makes way for mercy (Prov 28:13). The fourth ingredient of true repentance is shame for sin: True Repentance causes a holy bashfulness or embarrassment, i.e. it is the shame you feel when your inadequacy or guilt is made public. The Prophet Ezra prayed, “O my God, I am ashamed and blush to lift my face to You, my God, for our iniquities have risen higher than our heads, and our guilt has mounted up to the heavens” (Ezra 9:6). The repenting prodigal was so ashamed of his sin that he did not feel he deserved to be a son anymore (Luke 15:21). It’s like our Sin makes us feel shamefully naked and deformed in God’s eyes and puts Christ to shame, the one who took the scorn of the cross on himself. I’ve often feelt ashamed when I’ve been confronted by my sinfulness in the presence of God and when I’m will other believers who are walking closely with Jesus. The fifth ingredient in true repentance is a sincere hatred of sin: We must hate our sin to the core. We hate sin more deeply when we love Jesus more fully. Repentance begins with the love of God and ends with hatred of sin…. Tolerating sin is a willful leap toward committing it. True repentance loathes sin deeply. Finally, the sixth progressive ingredient of true repentance is turning from sin and returning to the Lord “with all your heart” (Joel 2:12). This turning from sin implies a notable change in the ways we live, “performing deeds in keeping with their repentance” (Acts 26:20). Ezekiel records these words of God to the house of Israel: “Repent and turn away from your idols, and turn away your faces from all your abominations” (Ezek 14:6). We are called to turn away from all our abominations—not just the obvious ones or the ones that create friction in others. The goal, end, destination or finish-line of true repentance is not to manufacture peace among others with perfunctory repentance, but rather to turn to God with all your heart, mind, soul and strength. Most importantly, though, this repentance is not just a turning away from sin; it is also a turning “of repentance toward God and faith in our Lord Jesus” (Acts 20:21). [We should repent of our] doubt by believing in the goodness, greatness and graciousness of God, and [turning] in faith to trust in the freedom the Lord Jesus Christ offers to each one of us in the Gospel. Repentance is rooted in a hatred of sin and a joyful awareness of God’s loving-kindness, which leads to joy: “God’s kindness is intended to lead you to repentance” (Rom 2:4). We rejoice that Christ has done everything for us—all that we need to secure our salvation and our growth in holiness. Why do ‘modern’ churches hate to teach on repentance? What’s wrong with preaching repentance? Answer: NOTHING: Because true repentance is one of the KEYS to unlock HEAVEN. (Only Satan would hate a Christian telling people to REPENT). The man-pleasing, modern, self-indulgent church has bent God’s KEY out of shape. Let’s straighten it and do what Christ has commanded: Preach Repentance.